Heliconius charithonia - Hodges#4418 (Zebra Longwing). Size: approx. 80 mm. Photo: 08/12/13, 2 pm. What a beautiful butterfly! They can be found in Florida and Texas throughout the year. This specimen and a bunch of its colleagues were attracted by a blooming bottlebrush in front of my kitchen window. 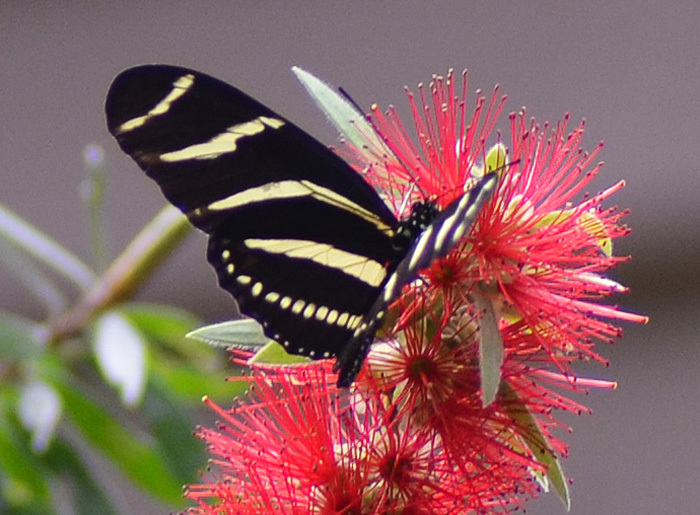 Since 1996, the Zebra Longwing is Florida's official state butterfly. Lots of information on this butterfly can be found in the wikipedia article.